Venom are legends of extreme metal - their second album (Black Metal) gave its name to an entire genre of music, and black metal bands still sing about the same subjects as Venom were doing 20 years ago - the devil, burning churches and so on. Perhaps because of their reputation as an extreme band, I'd somehow never actually listened to them until their new album arrived for me to review. What a revelation - I've definitely been missing out all these years, this is damn good stuff. Black metal bands tend to have growling vocals that normally just don't work for me - they're so unintelligile that the singer could be reciting his shopping list and nobody would know. Venom on the other hand have "clean" vocals - although they're so snarling and malevolent that clean hardly seems the right word, but they are just perfect for this music - easy to listen to, the lyrics clearly understandable, yet with enough anger and malevolence to make them fit the songs. Original member Cronos (Bass/vocals) is joined by two new members for this album - Rage (guitar) and Dante (Drums). It's hard to believe that a three-piece can create a solid wall of blistering noise as Venom do, but they certainly do it, and do it well. With song titles including "Hail Satanas", "Fallen angels", "Sin" and "Death be thy name" it's clear that Venom haven't mellowed over time, and the lyrics certainly confirm this impression. This is a really good album. It's got a really raw live feel to it which is so refreshing these days when albums sound so polished to get them perfect. This still sounds perfect but whereas many albums sound as though they were recorded by the band members doing their parts separately, Venom sound as though they turned up in the studio and played the songs live, recorded them then went off to party. 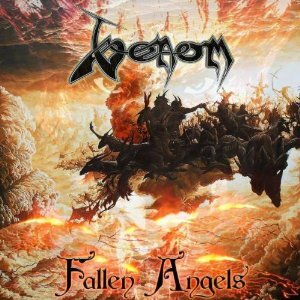 An excellent album from the legendary thrash/black metal veterans, Venom ! "Fallen angels" is out now on Spinefarm records.